Returning just in time for Fogo Island Inn’s 5th birthday month, Newfoundland-born, Norway-based architect Todd Saunders will be in residence at Fogo Island Inn between Friday, May 18 and Monday, May 21, 2018. Besides completing work on the Inn at one of the four corners of the Earth, Saunders has also lead architectural projects around the rest of the globe, with a practice that includes both private and public clients. Now, he returns to his home province of Newfoundland and Labrador to reconnect with Fogo Island Inn’s guests and staff, as well as the singular community that has been behind the Inn’s success, from conceptualization through construction and half a decade of successful operations. Guests at the Inn during Todd’s time in residence will have ample opportunities to meet and speak with Todd about his work and his practice, hear talks from the architect in the Inn’s cinema, join guided architecture walks, and uncover the deeper set of ideas and values that led to the seemingly improbable realization of these modern structures in rural Newfoundland. Saunders Architecture is based in Bergen, Norway and is about to open offices in London, Toronto, and New York. Todd Saunders has completed projects in over 10 different countries and continues to be commissioned all over the world to make architecture in vast natural spaces. His first project in Ontario, Canada has commenced on Lake Rosseau and several projects are currently under construction on the edge of Banff, Alberta. 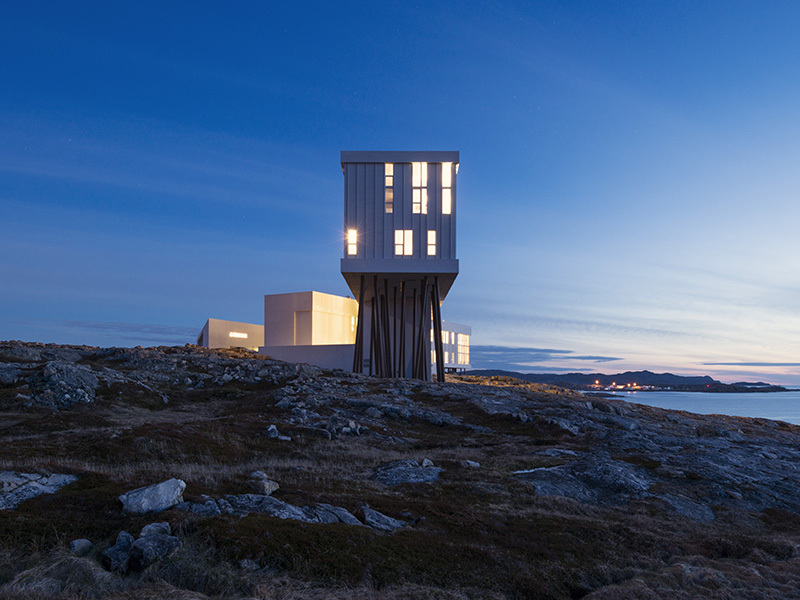 Guests of Fogo Island Inn staying during The Architect: Todd Saunders in Residence itinerary will witness that power first-hand. Through learning, conversation, and interaction, guests will discover much more than simply beautiful buildings: after all, Fogo Island Inn is a 100% social business that returns all profits to a charity, Shorefast, for reinvestment in community. Resolutely local, the Inn generates meaningful employment and “holds on” to Fogo Island’s history and culture, while the Fogo Island Arts artist-in-residence program “reaches out” into the wider world to bring international artists to the Island. The Architect: Todd Saunders in Residence weekend at Fogo Island Inn commences on Friday, May 18, 2018. More information on Fogo Island Inn’s The Architect: Todd Saunders in Residence itinerary can be found here or by calling toll-free at 1-855-268-9277 or direct at 709-658-3444. For an off-island preview of Todd Saunders’ reflections on the past ten years of his pioneering projects, the public is also invited to a talk at Toronto’s Art Gallery of Ontario on Wednesday, March 14, at 7:00 p.m. More information on the event can be found here: https://ago.ca/events/todd-saunders-what-does-10-10-equal.